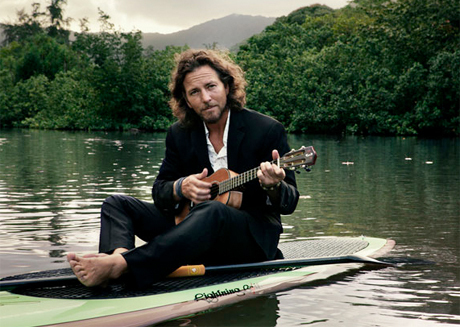 After Pearl Jam's triumphant 20th anniversary last year, we're sorry to report that frontman Eddie Vedder's 2012 seems to have got off to bit a of a lousy start. The singer recently suffered an injury that has caused him to postpone his upcoming solo U.S. tour. A post on Pearl Jam's official website reveals that the singer sustained a back injury earlier this year. This has resulted in some temporary nerve damage in his right arm that won't heal in time for him to fulfill his previously scheduled spring dates. Manager Kelly Curtis said in a statement, "After having worked aggressively with doctors and physical therapists for the last eight weeks to repair the damage, the intensity of the injury and time needed to heal has made it impossible to play the shows as scheduled. There was hope up until the last minute that the treatments would be successful. Sincerest apologies go out to those who have made plans and bought tickets. Eddie is frustrated beyond measure, but remains positive that come this summer all will be back in good form." There's no word as to what exactly what caused the injury, but Vedder is evidently confident that he'll make a full recovery, since he's already re-booked almost all of the shows for the fall. See the adjusted schedule below.